As Romanticism @ OSU sends its panel to ICR 2014, we’re excited to announce that we’ll be hosting a loose reading group for Thomas Pfau’s magnum opus Minding the Modern: Human Agency, Intellectual Traditions, and Responsible Knowledge (2013). We’ll first meet, having read Pfau’s brief exordium, to discuss how we’d like to proceed as a group. As some of us already imagine, we’ll build a wish list of particular chapters we’d like to talk about. 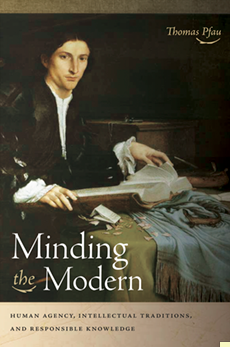 Minding the Modern is a tome, and we’ll try to take it nice and easy over the academic year. So far, the response has been enthusiastic, and I for one am glad to be talking about how we might raise the stakes of placing Romanticism (which functions as a critical moment in Pfau’s narrative) in much larger histories that tangle with the most difficult questions about the human experience. Posted in news	Tagged agency, intellectual history, minding the modern, pfau, reading group, will	Bookmark the permalink.